Looking for a complex caramel ? A creamy caramel is butter, sugar and cream. 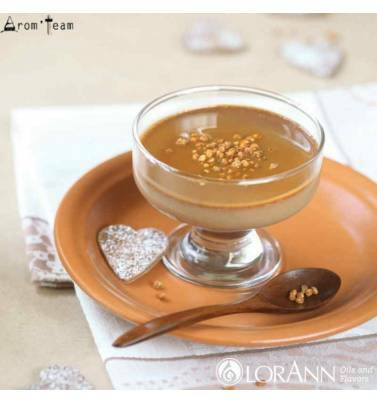 This caramel cream joined the recipe of the pastry and offers smooth, mesmerizing and natural caramel. Arom-Team review: a powerful caramel flavor, very tasty, closer to liquid caramel than caramel candy, one of the best caramel flavors ever tested which sublime even more in recipe, bringing its specific note without being sickening. To be dosed in moderation to enjoy its smoothness. This flavor, one of the best LorAnn oils for vaping, is sufficient on its own for fans of intense caramel taste but also in the composition of many DIY recipes. How to dose this LorAnn flavoring ? What is the steeping time for a custard caramel e juice ? Is this aroma only for vape ? LorAnn products are food flavors. You can therefore use them in pastry, ice cream, etc. How to use Lorann Oils for vaping ? All LorAnn flavorings are not suitable for electronic cigarette. This is why you will find on our site a precise selection of perfumes. LorAnn flavors are popular for diyers searching for natural and concentrated flavors. Some have become a must in the community. You will find below a top 5 of the best LorAnn flavors.